This fetching lamp makes a bright choice for a loyal nightlight. With a few puffs of air and quick twists, the balloon became a fetching friend. Nostalgia takes shape in this Pop Art-inspired lamp that will never deflate or float away (it's made of everlasting silicone). 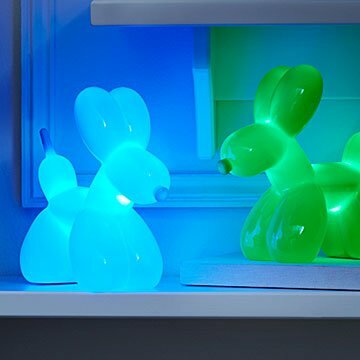 Give his hind paw a gentle squeeze to activate an internal LED that emits an ambient glow for 30 minutes at a time, making this illuminated watchdog a bright choice for a loyal nightlight. Made in China. To install batteries, unscrew the metal screw in the battery case lid and open the lid by pushing the rounded piece inward and upward. This magical gift was a perfect choice! I already bought a second one! I was concerned when I first received it because it was a heavy rubber/plastic. But these are terrific! I love one by my bedside; I can put it on, turn off all the other lights and still finish getting ready for bed and get into bed. Then I fall asleep with the lovely color, knowing it will turn itself off! I like it so much, I bought a second one for another room where I have to turn the light off way across the room and then leave the room in the dark. And, I purchased one for a friend. We bought this for my son for Christmas and even though he thought it was great, as a parent it was a waste of money. The light is incredibly dim and the battery dies so quickly - it isn't worth the investment. Now it is more or less just a inanimate thing on his dresser taking up space and we have had to purchase a second light for his room that actually acts as a night light. Unfortunately by time we realized what a dud it was, it was too late to return. I was really excited about this gift. My daughter loved it, but it started splitting at the tail within a few days and other areas started splitting within a couple weeks of use. As I can't find my order #, I'm not going to bother with the hassle of returning--but for the price, it was not worthwhile. This is such a cute item! So cute â€” A big hit! This is adorable and perfect for a nightlight, but not a lamp. It glows softly but doesn't put out much light. Our 7-year-old niece loves it! I would have given it 5 stars, but there was some kind of glue remnants on the surface that wouldn't clean off. My granddaughter loves it! That's the best recommendation I can give.